The ever popular beach hut kit has had a face lift. The roof has been extended at the front by 30 mm to allow a decorative eaves trim to be added. Window sills now slot into place on both sides of the hut. The small brass hinges that were once used to hang the front door have now been discarded in favour of the door now slotting into place. This is an easy to assemble flat pack kit. 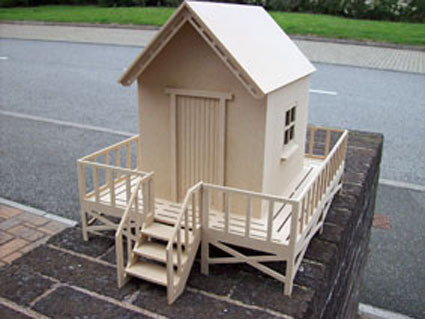 The beach hut is manufactured using state of the art computer controlled CNC routing technology ensuring that all components fit exactly into place.